very sick and it’s her time, but oh, how too-short that time has been. one. We had two, my little vanilla beans. that when we moved to the new house we had two yellow labs named Daphne and Regina." yet, they were funny and intrepid and clumsy and adorable. at 6 weeks, and a little standoffish — earnest and lovely at the same time. disrupted his sedate and middle aged existence. He was not amused. was a lovely, goofy girl, a side only the privileged few ever got to see. and loving every single day. the poor old girl has had enough. still with a good chunk of life ahead, full of surprises. Well, Dave and I are both in tears. So sorry for the loss of your buddies this year. We’ll miss them too. Our thoughts are with you today. I’m so sorry to hear about your loss. Y’all are in my thoughts. When I opened the pictures of your doggies!!! 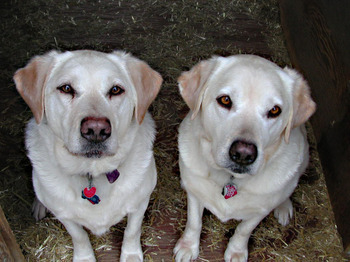 !…..they look just like my dog “boomer” He is a yellow lab mix…. I’m sending lots of love to you… I’m sure glad to know the Christine you are today. Gina, Daphne, and Zoe sure were lucky girls. What you said about your father, very moving. Such a sad time. A beautiful tribute to a dog who fully deserves it. And to a dog who fully deserved the wonderful life she shared with all of you. A beautiful tribute and hopefully a bit therapeutic for you. I have never connected the dots about the impact of a loss but after reading this post, I understand a bit more. I have felt those feelings about losing my mom but could never really put it into words. Thanks. One more thing: my guess is that these losses are exactly what we need to reinvent ourselves once again. This is a poignant post, Christine. I’ll be thinking good thoughts for you. There has been a lot of pet loss this week, it seems. I think it is wonderful you can use this blog as an outlet to share your relationship with your friend. It’s a great insights about what we mourn when we lose the creatures that accompany us through our adventures. I wish you a resilient heart and a long memory. I am very sorry to hear about your precious Regina Marie Puppy. Having been through this loss twice in the last eighteen months, I know how difficult it is. Please know that wherever our loved ones are, they are closer than we think. We are very sorry that Gina is going to the Bridge, but very happy that she will be reunited with Max & Daphne & Zoe. Sending you purrs and soft woofs. Oh, Christine, I’m so sorry to hear this. But what a beautiful post. I know it’s been a tough year in your doggy family. Hang in there. Our son (now 26) learned to walk by pulling himself up by our yellow lab’s ears (and other body parts). He lived to be 16. And our second roumd of pups are getting up there, too. I know how you feel. God bless you. Christine – I am SO sorry for your loss. We have a black lab about 8 and 1/2 years old. I’m already thinking about that day and how I’ll ever be able to get through it. Labs are the best! I have a lump in my throat right now…Bless you – You’ll be in my thoughts. My eyes have teared up reading this post, and my heart goes out to you 😦 Our pets are our children, companions and friends with oceans of unconditional love, so to lose them is a heartbreak 😦 You have written beautifully and eloquently of your losses, and if it is any consolation, I’m sure that the puppies loved every minute of being a part of your family as much as you loved having them a part of your clan. Beautiful post, and beautiful memories to carry forward. Oh boy. Once again it seems that we are exchanging soggy virtual hugs. Thanks for sharing your lovely experience. How amazing that those two black eyeliner-wearing “vanilla beans” reached out specifically to you through Jerry’s dream. I love that! I will patiently await the sunny day when your appetite returns and you are ready to share the next chapter of your experience with us! I’m so sorry to hear about the loss of your lovely Regina Marie Puppy. I have a sweet little cocker spaniel who’s just about to turn fourteen and has her own little old age ailments. Every time I see her these days, I give her an extra hug to let her know how important she is in my life and with an eye toward the day I won’t be able to do it anymore. Regina was a lucky pup to have such a caring family. Hang in there. What a beautiful post. I’m sending you good thoughts as you adjust to the loss of a treasured companion. I am so sad for you. Just a couple of weeks ago I wrote in my blog about my yellow lab getting older, so this really hit home. I’ve had dogs all my life, but this one is the first for us as a family. My kids’ first dog. It takes me back to when I lost my first dog. It breaks my heart to know what it will do to me, but also what it will do to my kids. Ouch. Christine–so sorry to hear about your loss. A beautiful tribute and thoughtful view of grieving. I know what you mean about mourning for for our own pasts. I can also tell that the road ahead for you and Jerry will be just as interesting and rewarding. Christine, please accept my heartfelt sympathy. Send you lots of hugs. I’m so sorry to read about your furry friends. May your heart heal quickly. You and your pack have seen so much loss this last year or so, and all of us that have loved a mutt or three grieve along with you. Those buttery pups rolling along and loving us make life rich, and we are better for it. I am really sorry to hear of your loss. I u’stand how you felt. I was devastated when I lost my Spitz. She was my first love truly.